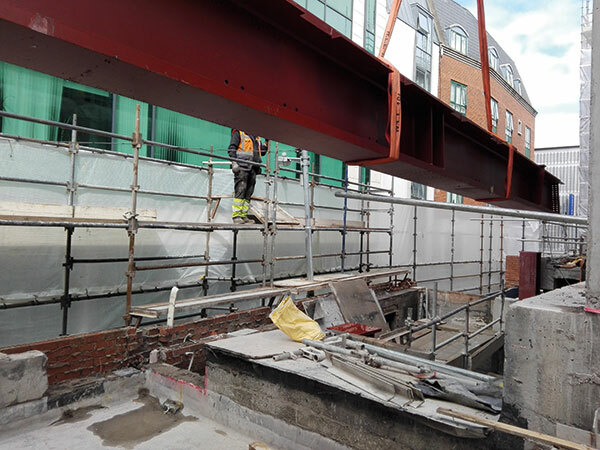 Working on behalf of main contractor MP Construction, steelwork contractor Fox Bros. Engineering has successfully installed two 11t transfer beams as part of the refurbishment works at the Grafton Capital Hotel in Dublin. The 11m-long Kloeckner Westok plate beams cantilever over a substation, which could not be moved, and support six-storeys of new bedrooms. “It is a very confined site with limited access and no margin for error. We had to install the beams on a Sunday morning as a road closure had to take place in order to get a crane in to do the lifting,” said James O’Hara of Fox Bros. Overall Fox Bros. will fabricate, supply and erect 250t of structural steelwork for the hotel project. The steel package is due to be completed by November this year.